The Oroville Dam, located in northern California, USA, confines a large water reservoir (Lake Oroville) with a retention capacity of about 4 km3. The lake level is controlled through a main spillway, consisting of a concrete chute nearly 1 km long and about 50 m wide that slopes for over 200 vertical meters down to the Feather River (Fig. 1). An emergency spillway, designed to be active in cases of extremely high lake levels, is located to the side (NW) of the main spillway, and consists of a linear concrete weir separating the lake waters from the wide valley flank that leads down to the river bed (Fig. 1). Fig 1: Map view sketch (A) and oblique aerial photo (B) of the Oroville Dam and its spillways. Left image by Shannon1, available at https://en.wikipedia.org/wiki/Oroville_Dam_crisis#... (CC BY-SA 4.0). Right photo by K. M. Grow, California Department of Water Resources, taken on May 11, 2016, several months before the spillway incident. Note how the emergency spillway is faced by a vegetated slope with no artifacts or structures to confine flow or control erosion in case of spilling. Exceptional rainfall in the Winter of 2017 caused significant inflow into the reservoir and required activation of the main spillway to control the lake level. On February 7, an irregular flow behavior was detected in the middle part of the main spillway chute. Water discharge was interrupted to investigate the cause of the anomaly, revealing that the concrete chute was severely damaged over tens of meters. A large section of concrete had been washed away and water had already created an erosional path to the left (SE) of the chute (Fig. 2). However, because of increasing lake levels caused by exceptional rainfall, discharge on the damaged spillway was reactivated on February 9, with outflow rates varying between of 1120 and 1820 m3/s. In spite of this renewed outflow, the lake level kept rising, reaching more than 901 feet on the night between February 11 and 12, and causing overflow at the weir of the emergency spillway for the first time in the history of the dam (Fig. 3). Fig 2: Map view sketch (A) and oblique aerial photo (B) of the damage and erosion observed on the main spillway of the Oroville Dam, on February 7, 2017. Left image by Shannon1, available at https://en.wikipedia.org/wiki/Oroville_Dam_crisis#... (CC BY-SA 4.0). Right photo by K. M. Grow, California Department of Water Resources. Dashed line indicates damaged area. White arrow points to car, for scale. Fig 3: (A) Map view sketch of water flows at the Oroville Dam on February 12, 2017. An exceptionally high lake level triggered overflow at the emergency spillway. Image by Shannon1, available at https://en.wikipedia.org/wiki/Oroville_Dam_crisis#... (CC BY-SA 4.0); (B) View of overflow at the emergency spillway and incipient erosion of soil cover and bedrock downstream of the weir. Photo by K. M. Grow, California Department of Water Resources, taken on February 12, 2017. Fig 4: (A) Map view sketch of main erosional and water flow features at the Oroville Dam after overflow at the emergency spillway was stopped. 1 = area where crews started to work from February 13 to reinforce the partially damaged weir; 2 = erosion and bedrock incision downhill of the emergency spillway; 3 = zone of accumulation of debris from erosion and bedrock incision along main spillway, causing upstream blockage of the Feather River and interruption of functionality of the power station. Image by Shannon1, available at https://en.wikipedia.org/wiki/Oroville_Dam_crisis#... (CC BY-SA 4.0); (B) View of channelized flow pattern diverting from damaged main spillway and confined to newly incised canyon. White arrow points to channelized incision created on February 12 by water outflow from the emergency spillway. Yellow arrow points to river bar consisting of debris accumulated from the erosion occurring at the main spillway. Photo by K. M. Grow, California Department of Water Resources, taken on February 26, 2017. The extent of erosion attained in just a few days at the main spillway is remarkable. The concrete spillway chute was destroyed and torn away in its middle to lower section. Next to the chute, a canyon was incised, several tens of meters deep and several hundred meters long (Figs. 4B, 5A). Overflow from the emergency spillway removed soil cover and caused significant bedrock incision in just one day (Figs. 4B,5B). Fig 5: (A) View of the effects of erosion at the main spillway. Middle to lower section of the concrete chute is missing or damaged and a deep canyon has been incised to the SE of the chute. Photo by D. Kolke, California Department of Water Resources, taken on February 27, 2017; (B) Channelized incision downstream of the emergency spillway, generated in approximately 1 day of outflow. Arrow points to person for scale. Photo by F. Low, California Department of Water Resources, taken on February 18, 2017. The bedrock in the area affected by erosion is part of the Jurassic Smartville Complex, and consists of low grade metavolcanics of mafic composition, with sheeted diabase intrusions. [iii] The tabular nature of the volcanics and of the subsequent sheeted intrusions confers a distinctively layered aspect to the unit. Layers dip at a relatively high angle to the east, against the slope of the valley (Fig. 6). The planar discontinuities of the layering and some fractures favored plucking of blocks as the main mechanism of erosion under solicitation by hydraulic flow, as demonstrated by the abundance of planar faces on the angular blocks in the debris pile and on the jugged surface of the eroded bedrock (Fig. 7). Fig 6: Bedrock exposed after erosion at the main spillway. High angle layering highlighted by black dashed line. Arrow points to group of people on concrete chute for scale. Photo by F. Low, California Department of Water Resources, taken on March 3, 2017. Fig 7: (A) Angular blocks of bedrock accumulated on the bed of the Feather River, downstream of the main spillway. Photo by B. Baer, California Department of Water Resources, taken on March 1, 2017. (B) Outcrop showing flat faces and sharp edges suggestive of bedrock plucking, next to damaged concrete of the main spillway. Photo by F. Low, California Department of Water Resources, taken on March 4, 2017. Weathered bedrock (yellowish brown color) is certainly less competent than the fresh lithology (bluish-green color), and spatial variations in thickness of this top level might have played a role in determining the points where extensive erosion was initially concentrated. However, significant fresh bedrock erosion took place both at the main spillway and downhill of the emergency spillway (Figs. 5-8). Fig 8: (A) Both fresh and altered bedrock is exposed along the incision path downstream of the emergency spillway. Photo by D. Kolke, California Department of Water Resources, taken on February 15, 2017. (B) Both fresh and altered bedrock has been eroded under the main spillway. Photo by F. Low, California Department of Water Resources, taken on March 3, 2017. Fig 9: Coarse-grained fluvial bar generated at the confluence between the new incised canyon by the main spillway and the Feathered River, before (A) and after (B) halting water discharge through the spillway. Photos by D. Kolke, California Department of Water Resources, taken on February 27, 2017. At the beginning of the crisis, there had been fears that the service spillway, initially damaged in its middle section (Figs. 2B,10A), would be affected by back-stepping erosion and collapse, thus attacking the dam itself. In fact, this happened at first (Fig. 10B), but most incision seems to have concentrated in the narrowed flow cross-section of the newly cut canyon next to the chute, with relatively minor headward propagation of erosion (Fig. 10C). Fig 10: Damage on the chute of the main spillway at three different times during the crisis. Horizontal yellow line is given as a reference point across the three images. Black arrow in (C) points to person for scale. Original photos by K. Grow (A,B) and F. Low (C), California Department of Water Resources, taken on February 7, February 9, and March 3, 2017, respectively. The initial cause of the damage at the main spillway, as well as the extent and mechanisms of subsequent erosion will be thoroughly investigated by engineers and geologists. Here appropriate technical and professional publications are to be expected. 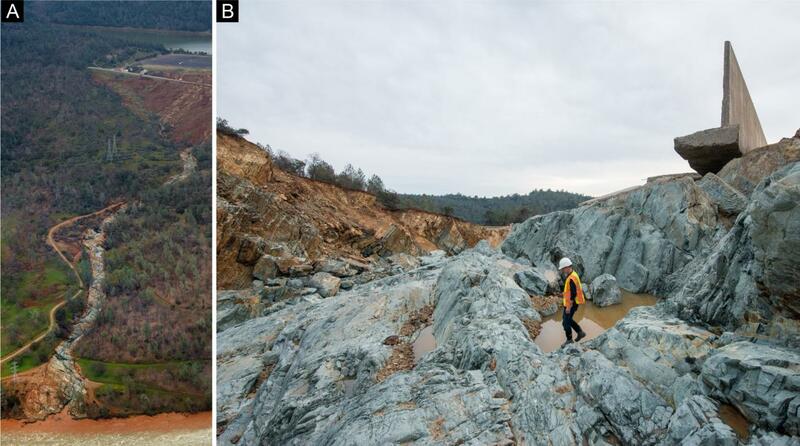 This event of observed erosion provides the rare opportunity to analyze the formation of a canyon and test models used to account for large-scale erosional features of the landscape. After all, the idea is still widespread that deep river canyons (e.g., Grand Canyon of Colorado) formed over prolonged geologic time by slow and gradual fluvial incision; in contrast, there are observational data that suggest the possibility of canyon formation during high-energy and rapid erosive events. [vi] Most importantly, the observation of bedrock erosion and formation of depositional bars over short time scales in a relatively localized area is a powerful miniature representation of what could be expected in the context of non-uniformitarian, large-scale water flows. [i] An informative graphical and descriptive timeline of the events can be found in this report from the California Department of Water Resources: "Lake Oroville Spillway Incident: Timeline of Major Events February 4-25"; accessed on 09/20/2018. [ii] Video clips showing the different phases of the crisis and the subsequent reconstruction efforts can be watched on the Oroville Spillway Incident YouTube page of the California Department of Water Resources. [iii] Saucedo, G.J., Wagner, D.L., (1992). Geologic map of the Chico quadrangle, Regional Geologic Map 7A, California Division of Mines and Geology. Day, H.W., Bickford, M.E. (2004). Tectonic setting of the Jurassic Smartville and Slate Creek complexes, northern Sierra Nevada, California. GSA Bulletin, 116, 1515–1528. [iv] For another example of rapid formation of coarse fluvial bars during flooding conditions, see Mosher, S.‐J., Martini, I. P. (2002). 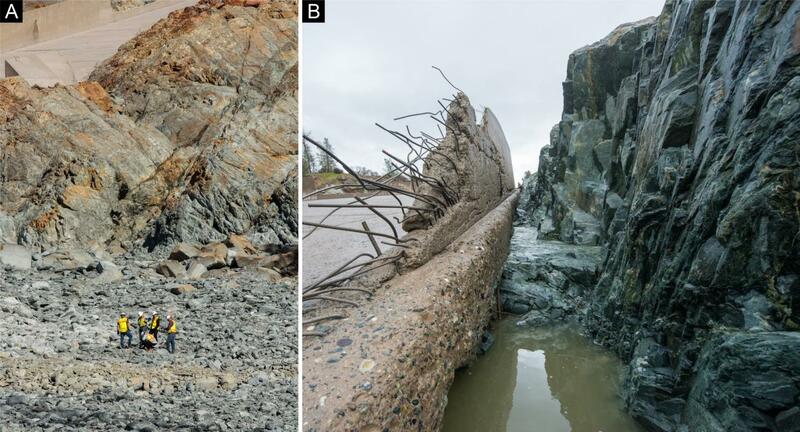 Coarse‐grained flood bars formed at the confluence of two subarctic rivers affected by hydroelectric dams, Ontario, Canada. In: Martini, I.P., Baker, V.R., Garzón, G. (eds. ), Flood and Megaflood Processes and Deposits: Recent and Ancient Examples. International Association of Sedimentologists Special Publication 32, Wiley-Blackwell, Oxford, UK, pp. 213-231. [v] See Baker, V.R. (2013). Global late Quaternary fluvial paleohydrology: With special emphasis on paleofloods and megafloods. In: Shroder, J., Wohl, E.E., (eds. ), Treatise on Geomorphology, Fluvial Geomorphology, vol. 9, Academic Press, San Diego, pp. 511-527; Kotulla, M., (2014). Megafluten. Studium Integrale Journal 21, 4-11. [vi] For a detailed discussion, see Ernst, M. (2010). Bildung eines Canyons in nur 3 Tagen. Studium Integrale Journal 17, 88-92.